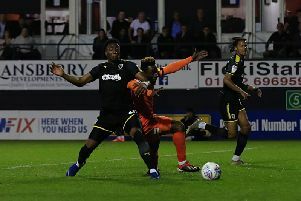 Hatters chief executive Gary Sweet believes there is finally a ‘glimmer of light’ in the club’s attempts to build a new 17,500 stadium at Power Court and mixed use scheme at Newlands Park. Luton submitted their plans to Luton Borough Council back in August 2016, but are yet to find out if they will receive the go-ahead or not. The council had hoped to be in a position to consider the proposals by the end of April, however, that never materialised, with a new date of August not met either then due to a delay in receiving a council-commissioned retail impact assessment for Newlands Park. However, writing in his programme notes for last night’s game with Bradford City, Sweet said: “Whilst I can't give you a categorical update on matters as we approach the end of 2018, I can tell you that we are now seeing the glimmer of light at the end of a tunnel the scale of The Delaware Aqueduct! “Patience is a virtue and you have all been so patient and virtuous during this important period since we submitted in August 20016, for which we sincerely thank you. "If patience was sold in shops, the local retail sector would be booming. Sweet’s message to supporters carried on from another indication that a date when the development control committee will get to vote on the applications was forthcoming, as Deputy Leader of Luton Borough Council and Portfolio Holder for Transformation and Regeneration, Cllr Sian Timoney, tweeted over the weekend: “Hoping to be able to announce committee dates very soon!